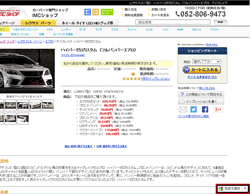 If you want to buy the Japanese original dressup car parts, please feel free to contact us. Thank you for visiting our website. 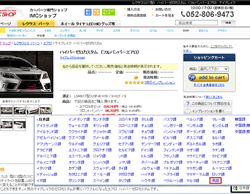 As you see, we are selling Japanese original dressup car parts. We can export those items to your country, so if you need quotation, please contact info@imcshop.com. 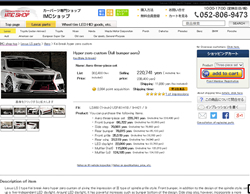 Our sales price is very low, but the price includes Japanese sales tax. So when we ship to your country, we deduct the sales tax which is 8%. The shipping cost is different depend on your place and sea or airplane. So we will make you shipping quotation as you want. We only accept Japanese yen, and we need to use our system. From the system, you can choose credit card payment and bank payment. But if you don’t have Japanese bank, the bank payment costs too much. So we recommend credit card payment. Here is the procedure to buy with credit card. click this or the image to see bigger size. Select your language from Google Translation. 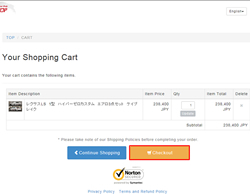 when you decided to buy, click "add to cart"
choose English. 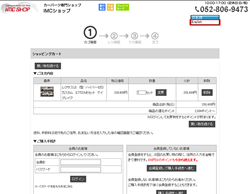 At this moment, we have only Japanse and English on the cart page. Click "check out" and proceed as cart says.